It is with sadness and recognition of a life well lived that the family announces the passing of Karin I. (Persson) Closson at age 93. Predeceased by her parents, Godfrey and Annie Persson; husband, George; her Persson siblings and Closson in-laws, Karin lives on in the memories of her children: Janet (Ernie) Steinhubl; Reg (Carol) Closson; grandchildren Marty (Shani) Steinhubl, Devin Closson (Stephanie), Deanne Closson (Tyson); and a host of family and friends. Karin was born on Torsby Farm, south of Stockholm, SK. She enjoyed school and completed Grade 9 by correspondence course. At age 19 Karin became the first provincial organizer for the C.C.Y.M. (youth group of the Co-operative Commonwealth Federation). In that role, she visited almost every part of Saskatchewan, helping to build the grassroots of the C.C.F./N.D.P. party she so strongly believed in. Karin’s passion for politics and advocacy never left her. In 1950, Karin married George Closson from the Freedhome District, south of Dubuc. Together they ran a mixed farming operation where hard work and perseverance carried them through some challenging times. George and Karin retired to Stockholm in 1985. Always very involved in community activities, the couple enjoyed visiting with people and loved having their grandchildren around. They were wonderful dancers and spent many Saturday nights at West End Hall on Round Lake, enjoying the good times with family and friends. Music was always a big part of Karin’s life. Growing up, everyone in her family played an instrument or sang. Karin was a member of the New Stockholm Lutheran Church Choir for 60 years. She shared her voice at weddings, funerals, and birthday parties, often singing duet with brother Loyd. Love of music enriched Karin’s life and comforted her in tough times. Never more so than when in 2002, George suffered a stroke which left him paralyzed on one side. Karin’s caring, generous and hospitable ways never changed, nor did her community spirit – in her late eighties, she contributed to the publication of a history book about the RM of Fertile Belt. She chaired the History Book Committee and volunteered hundreds of hours researching and writing. Always personable and outgoing, Karin could initiate a conversation with anyone. She loved her family, her friends and her home, and for many years never missed a Blue Jays game! Nice crystal, jewelry and fine china were favourite things. She loved to embroider and crafted many beautiful tablecloths and pictures. She loved to read and found great pleasure in the world around her – fields of grain, flowers, prairie sunsets. Most of all, she loved family times and children’s laughter. In June 2015, Karin celebrated her 90th birthday surrounded by family and friends. In the fall of that year, she moved into Esterhazy Centennial Special Care Home where she stayed engaged and active for as long as health permitted. Karin delighted in annual family reunions at Torsby farm, especially if there was a new baby to hold! And she never stopped enjoying visits to her beloved Qu’Appelle Valley. The family extends their sincere thanks to the staff at ECSCH and to Dr. Botha for their compassionate and loving care. 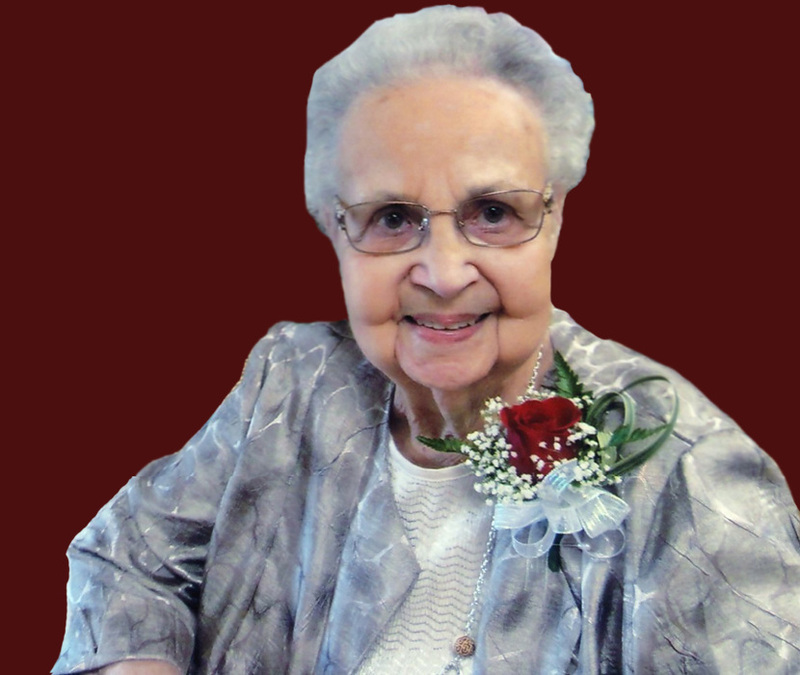 A funeral service will be held at the New Stockholm Lutheran Church on April 20, 2019 at 2:00 p.m., followed by interment at Spruce Home Cemetery. Donations may be made to either the Spruce Home Cemetery Fund or the New Stockholm Lutheran Church Memorial Fund.